New 2018! 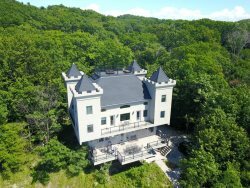 - Castle Park is part of a small, private lakeside vacation community nestled in the wooded dunes of Lake Michigan where families and friends have gathered together for over a century. Situated between Macatawa and Saugatuck, the cottages offer close proximity to lovely beaches, eight clay tennis courts, dances, and family-friendly barbeques and activities. This home will make you feel like your living in the trees with it's many windows and skylights. This vacation home is minutes away from all of your favorite "Things To Do!" Castle Park offers a summer experience of a by gone era. Start or end your stay with at the Friday evening BBQ and gather for sunsets and Saturday evening dances overlooking the lake. You can begin your day bringing your children to a well-loved kid's camp each morning, they will love the games and exploration while you take a tennis lesson from the pro, walk along the beach or hike the paths in the forest preserve behind the house. Walk, bike, or use the golf cart to travel around the association grounds. Act out a play in the amphitheater, take a swim in the pool, read a book at the castle library, and enjoy an ice cream cone at the Barnswallow. In the evening, wander to the dune to enjoy the sunset and Saturday evening dances. All, this plus lovely sandy beaches and the beautiful unsalted water of Lake Michigan. Back at the cottage, rinse off in the outdoor shower and relax on the large decks nestled in the woods of the forest preserve, it’s like staying in a luxury tree house! There are comfortable couches and two dining spaces each for ten guests to gather for meals, conversation, and just being together as well as two dens for quiet time and reading. This is a vacation spot you won’t want to leave. This home features 5 bedrooms and 4 full bathrooms, so there will be plenty of room for everyone to have their own space. The master bedroom features a king bed, as well as a walk-in shower and jetted bath tub. Two other rooms each hold a queen bed. There is one room with two twin beds, and one with two sets of twin bunk beds (perfect for the kids!). There is a family room in the front of the home with lots of windows that allow natural sunlight to flood the room. You can also enjoy your time relaxing in the trees on the two decks and enclosed areas. The house also offers an outdoor shower to wash off at after a long day at the beach!